Nothing says summer like a ripe, juicy peach! Stone fruits—peaches, nectarines, plums, apricots, and cherries—are sought-after summer fruit that can make your taste buds dance. There are so many ways you can enjoy these tasty treats which are in season from June through September. And they are not just for snacking. Stone fruit can be dried, grilled, poached, roasted, and sautéed. You can make a quick fruit salad with stone fruit, a delicious jam, or grilled fruit (just brush fruit halves with melted, unsalted butter, sprinkle with sugar, then grill over low heat for about 10 minutes or until soft and glazed). Health-wise, stone fruits offer many benefits. 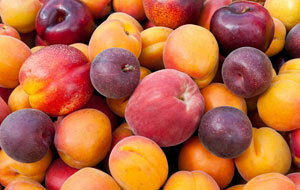 Peaches and plums are high in vitamins A and C, and they’re a good source of antioxidants and fiber. Apricots are an excellent source of vitamin A, a very good source of vitamin C, and a good source of fiber and potassium. Sweet cherries are rich in anthocyanins, beta carotene, quercetin, and vitamin C. Sweet cherries also offer a great source of potassium, which is a natural blood-pressure reducer. One cup of ruby red cherries offers approximately the same amount of potassium as one small banana. Nectarines are low in fat, sodium- and cholesterol-free, and they’re a good source of vitamin C.
Don’t let summer pass by without incorporating sensational stone fruits into your diet!